The restaurant was convenient with friendly staff. We had a beach view from our room and the room was comfortable, if a little tired-looking. Great location near the theatre and withing easy walking distance of public transport to the city. The night life was busy but we felt quite safe walking around the area late at night. Staff could not have been better - kind, personal, professional. Food was much better than I expected for a hotel chain too. Location was perfect. Tram was directly outside the hotel. Acland St was 5 min walk with lots of shops, supermarket and quaint stores. Restaurants and coffee shops were amazing. Beach opposite and Luna park was 1 min walk. Skybus from Melbourne airport drop off and pick up from hotel which was very convenient. Staff were exceptional and so very helpful they made my stay very enjoyable. Location was wonderful. Easy walk to everything. View was very nice. And room was quiet. We were upgraded so the bed was very comfortable but wondered why my grand-daughter was given the suite and myself small room and could her taps running and noises in the next rooms! Great views, close to shops and restaurants. Staff was friendly and helpful. 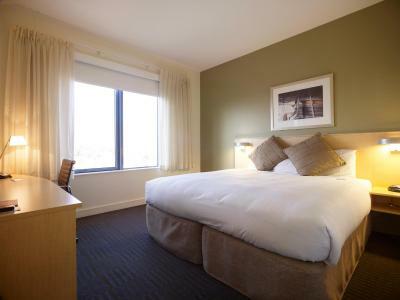 Novotel Melbourne St Kilda This rating is a reflection of how the property compares to the industry standard when it comes to price, facilities and services available. It's based on a self-evaluation by the property. Use this rating to help choose your stay! 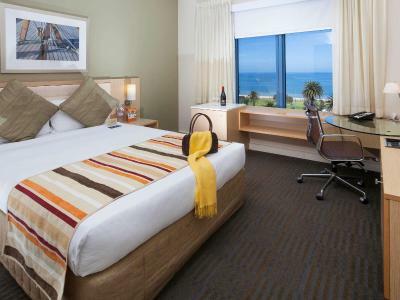 One of our top picks in Melbourne.Novotel Melbourne St Kilda is located in the seaside suburb of St Kilda. Right on the beach and only 6kms from Melbourne city, with many rooms offering spectacular views of the bay. The light and airy rooms have satellite TV and air conditioning. Some rooms are also equipped with spa bathtubs. 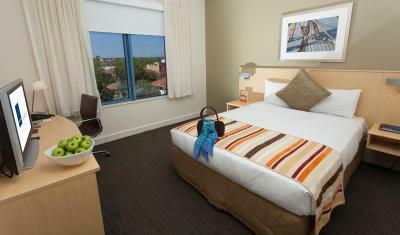 Novotel St Kilda features a heated swimming pool, a fitness center and on-site parking. Enjoy terrace dining in the Grill 3182 Restaurant and Bar. 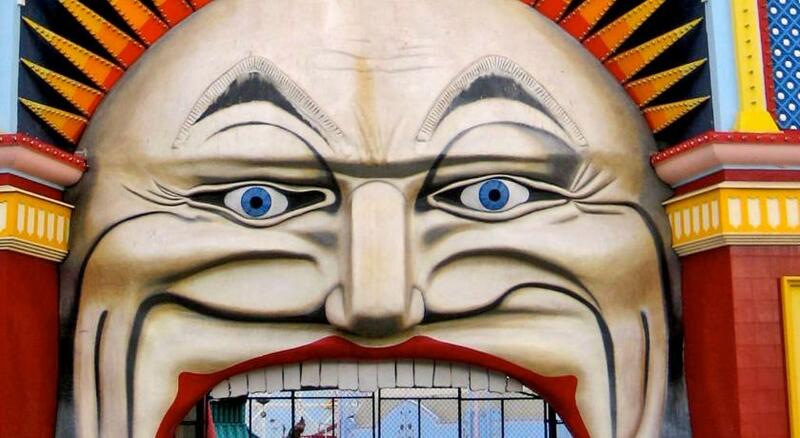 From the hotel you are easy walking distance from Luna Park, the famous Sunday art and craft market as well as Acland and Fitzroy Street which are prime shopping, dining and nightlife areas. 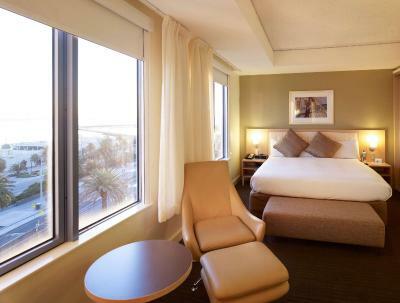 When would you like to stay at Novotel Melbourne St Kilda? This air-conditioned room has a flat-screen cable TV, a work desk with wired internet access, minibar and tea and coffee making facilities. Ironing facilities, in-room safe and free access to gym and pool are also available. 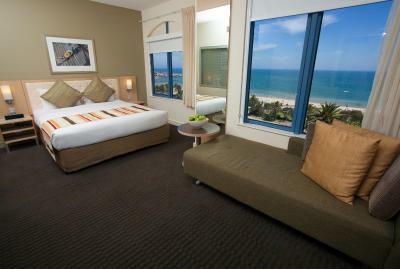 This air-conditioned room has stunning views of Port Philip Bay, the Esplanade and St Kilda Beach. It has a flat-screen TV with cable channels, a work desk with internet access, a minibar and tea/coffee making facilities. 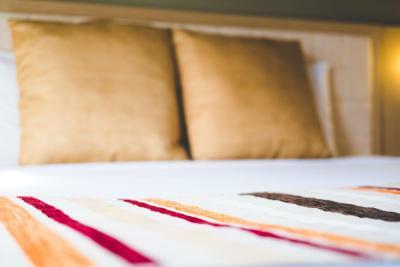 Ironing facilities, in-room safe and free access to gym and pool are also available. This air-conditioned room features a flat-screen cable TV and a work desk with wired Internet access. It has a minibar and tea and coffee-making facilities. There are also ironing facilities and an in-room safe. Free access to the gym and pool is available. This quadruple room features air conditioning, mini-bar and electric kettle. 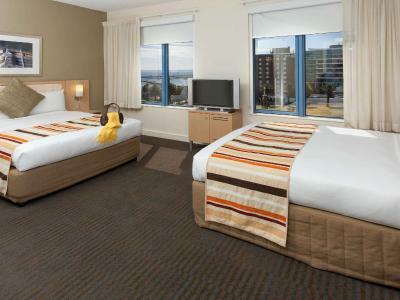 This triple room has a mini-bar, cable TV and seating area. House Rules Novotel Melbourne St Kilda takes special requests – add in the next step! Novotel Melbourne St Kilda accepts these cards and reserves the right to temporarily hold an amount prior to arrival. The Hill , I’m old !!!! The room was very dated. Bathroom facilities and size of room was below expectation. Bare essentials type of room. The view was great. Excellent location. Great location close to entertainment and restaurants. Staff friendly and helpful. We accepted to take the upgrade at the cost of 30 AUD per night for the first 3 nights booked under Coleman for a sea view and the suggested ground floor room. Sea view was acceptable although T eh wheel blocked some of that. The room space excellant. Problem was, the booking staff omitted to tell us the most important thing that would affect our comfort. That was, a Salsa event was directly BELOW our room? The amount of people still turning up in cars after 10pm and then the function noise and level of dance 'beat' music we could here left me very tired. I phones a request for the noise to be lowered, asked when it was due to fi air and was informed it was 1:15. Unfortunately even when the music stopped the bar room and garden area directly below our room meant we were further subjected to the exit noise, drinking noise and so ike achat that continued onto 2pm. I was very tired. The manger offered to deduct the upgrade costs for 2 nights. Not sufficient as it was never going to enable us to recover our lost sleep. We felt abliged to accept his offer. But forwarned is for-armed and we would have kept original city veiw room had we know in advance. Partner was suffering from a terrible cough and tried to sleep early and rest. Not possible without ear plugs. Not really acceptable. I believe our charges should have reverted to our origunal cost for the city room for ALL of our stay. My booking was one night on the Sunday night only ( option to cancel) at a special rate from Booking.com and by the time we had recovered we were to late to cancel and move hotels. Conclusion - we only had the option to stay on. On the positive they did let us remain in that larger room. That was at least some rest bite. Location, staff, upgraded room larger than average. More space. Our room was very ordinary. It had a tiny window with a view of other people’s windows and resembled a cell more than a plush hotel room. It was really run down and in need of maintenance. The bed was 2 singles pushed together, which is fairly standard, except they usually have a king mattress on top, whereas this had two single mattresses, so there was a big saggy gap in the middle. It has so much potential, but unfortunately is a let down. The location is fantastic, particularly if you’re headed to the Palais for a show. It has potential to be great for families, with a kiddy corner in reception, along with a pool and sandpit, but personally 2 beds in a tiny room don’t make for a relaxing holiday. Families need space and apartment facilities, so it’s not somewhere I’d stay as a family. Hotel was old and tired inside. The bathroom was not great, shower was not up to standard and the toilet leaked and flooded the bathroom. Location was great for the beach but the hotel inside was not up to modern standards and needed refurbishment. Expensive for the quality of the room.